We’ve all heard those three little words a lot, to the point where it has started to become a somewhat monotonous mantra. We hear them sprinkled into half of the interviews we read and hear with players and league commissioners. We see the phrase everywhere on social media. Even the name of this very site was inspired by those three words. Whether you like it or not, “grow the game” is attached to women’s hockey, and it’s not going anywhere soon. Women’s hockey is one of the fastest growing sports in the world. The evidence of that growth goes beyond the record-setting television audiences for gold medal games, the continued involvement of NHL teams with pro women’s teams, and the groundbreaking purchase of the NWHL’s Buffalo Beauts by Pegula Sports and Entertainment. We have the data to prove the women’s game is growing all over the world. At the inaugural IIHF Women’s Ice Hockey Workshop in Copenhagen in July, IIHF Women’s Committee Chairwoman Zsuzsanna Kolbenheyer shared that there are now nearly 200,000 women playing hockey across the world; in 2010 there were just over 170,000. That’s a growth of 17.64 percent in eight years. Thanks to USA Hockey’s public registration numbers, we have a better idea of what that growth looks like for one of women’s hockey superpowers. USA Hockey breaks down its registration numbers by gender, age group, and geography. The numbers paint a clear picture. There are more women playing hockey in the U.S. than ever before, and the numbers just keep growing. In 2017-18 the rate of growth in USA Hockey’s women’s registrations was nearly 6.5 times greater than the growth in men’s registrations. There are still far more men than women playing hockey in the U.S. and across the world, but that is hardly surprising when we look at the big picture. The NHL has existed for a century, whereas Title IX has only been in place in the NCAA for less than half a century. The first NCAA women’s hockey program was established at Brown University in 1965, and the National Collegiate Women’s Ice Hockey Championship began back in 2001. Even the prestigious Patty Kazmaier Award has only been around since 1998, which is the same year of the first women’s hockey tournament in the Winter Olympics. In many ways, women’s hockey is still just getting started. But that doesn’t change the fact that this rate of growth is significant. And, if history has taught us anything, we are about to see another boom in registrations in the wake of Team USA’s gold medal victory in Pyeongchang. Today, there are more than 79,355 women registered with USA Hockey. What’s even more noteworthy is the rate of growth in girls registering with USA Hockey. There are 33,236 girls 10 and under who are registered with USA Hockey. To put that number into context: there were 6,336 total female registered players in the United States in 1990. A closer look at the registration numbers — especially in youth hockey — tells us an even more promising story. USA Hockey’s numbers show that the growth of participation among girls 8 years and younger is growing at a historic rate. So, where is this growth coming from? One of the clear catalysts is the National Women’s Hockey League (NWHL). The NWHL’s inaugural season took place in 2015-16. In that same season the number of girls 8 years and younger who registered with USA Hockey went from 16,539 to 18,350 — that’s a 10.9 percent rate of growth. When we compare that number to the growth rates of the previous two seasons, we can safely say that the NWHL has changed the landscape of girls hockey in the United States of America. When looking at these numbers it’s important to remember that they only reflect those players who have registered and paid fees to have a membership USA Hockey. There are a lot more women — in all age groups — playing hockey in America. The future of women’s hockey is bright not just in the United States, but across the globe. According to the IIHF, there are 86,925 female players in Canada, 6,527 female players in Finland, and 5,505 female players in Sweden. An IIHF survey from 2017 tells us that 8.54 percent of all Finnish hockey players are women; that same ratio stood at 8.61 percent in Sweden. Whereas in Canada (13.7 percent) and the United States (13.5 percent), those numbers are significantly higher. So, there is still abundant room for the game to grow, even in countries that have a strong tradition in the sport. It’s hard to know just how much the game is going to grow over the next four years, but it is exciting to think about. In addition to the expected boom in interest after Team USA’s gold medal victory in Pyeongchang, there’s also the new frontier of women’s hockey in Asia. With Beijing 2022 on the horizon, China is investing in women’s hockey on a major scale. In June 2017, China announced plans to build 750 new rinks by 2022. Little girls in China also have the opportunity to watch members of Team Canada and Team USA compete against their own CWHL team in Shenzen, the Shenzen KRS Vanke Rays. Two years ago that sentence would have been complete fiction. What fruit will all these measures to accelerate the growth of the game in China bear? We will have an answer sooner than you might think. The world map of women’s hockey continues to grow every year. 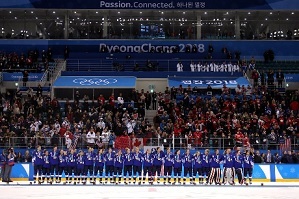 Pyeongchang’s gold medal game between Canada and the U.S. had 3.7 million viewers (streaming and broadcast numbers combined). Oh, and that game wrapped up a little after 2:00 a.m. ET. Hockey is one of the least accessible sports in the world because of how much it costs to even learn the game, let alone play it at a competitive level. Despite that significant roadblock — which, unfortunately, is just one of many — the game is still growing strong. And it’s showing no signs of slowing down. “Grow the game” is a mission statement and a philosophy. But it’s also a constant reminder to appreciate the movement that is happening around us, all over the world.